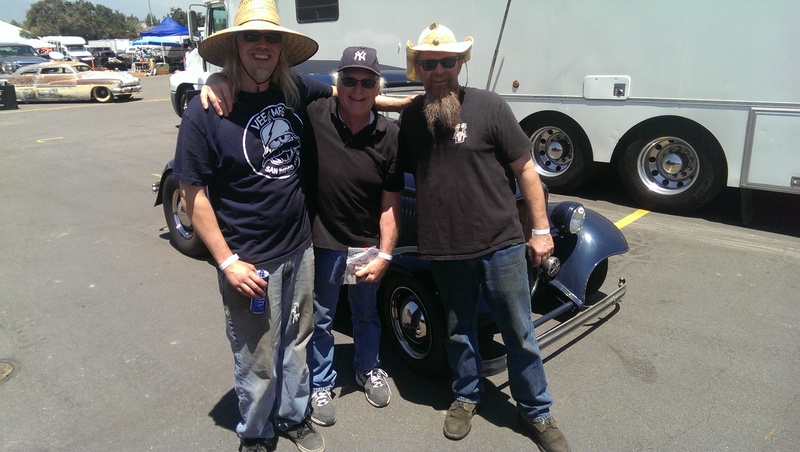 X-member – Industrial Chassis Inc.
We had Bean’s Book of Rod Shops stop by last week. These guys travel around the country and shoot video of different shops. Here is some footage they took. After squaring and leveling the donor frame from Bill Wilson, I set a Datum at the original Axle centerline. Then Taking careful measurements I can construct a representation in Alibre’. Added the rear half of the frame from previous. Also changed the way the bumpout for the core support works. Not technically correct but works with my software. Locating all the critical holes needed for current and future projects. Alibre’ 12 isn’t as sophisticated as it could have been. Doing a mirror of the Right frame rail wasn’t as easy as a command. I had to re-generate each sweep, boss, and cut the opposite way to generate the Left side rail. Tried an approximation of the stock transmission crossmember. I may go back and re-draw it. Added the rear body mount crossmember and gussets as well as the forward crossmember for supporting the rear springs. Very similar to the 61-64 kits, this one requires a taller boxing plate and different locating holes. The longer boxing plates should solve the problem of the long and unsupported front frame section once the stock Twin-I-Beam crossmember has been removed. Full bolt in, actually stiffens the frame and allows for a transmission change. Now includes front frame horn liners and “bolt-in” front split wishbone mounts. Available now, hit the store! As started by yet another shop in town and resultant failure to build a sound foundation, this 1951 Chevrolet 1ton was altered, shortened and modified into a mess of a chassis. Way past budget and nearly two years after it was commissioned the truck ended up on my doorstep. What showed up was powdercoated in a grey and black hammered finish. The weld porosity was clearly visible through the coating, the rails were not straight and every hole to attach the body, bed and running boards was welded up and boxed to prohibit future attachment. As delivered by our client fresh from the other shop. this front end poorly installed, nothing lined up side for side. Notice the offset and non-level mounting of the rack? This rail had a pretty severe twist to it. Not only was the frame not square or true, the front end was un-alignable, no mounts for the coil overs on the lower control arms, the rack was offset to the passenger side over an inch. It took 5/8″ shim to get the left side to align and no shims in the right I still got over 1/2º positive Camber and only 1º positive Caster. Because of the offset of the rack and it’s misplacement, the front end had a pretty severe bumpsteer on the left side and a proper connection between the rack and the spindle on the right was not possible without inches of toe out. The rear suspension was so poorly installed that the bars could not be installed without forcing things into place and the coil overs were in a serious bind if the rear was adjusted for proper pinion angle. The panhard rod was also too long and so far out of alignment that it couldn’t even be forced into place. 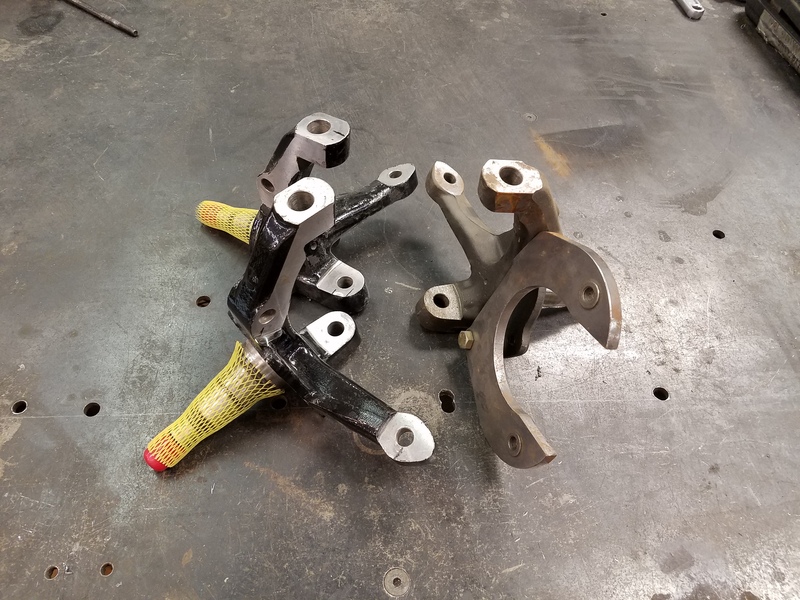 Even the rear axle housing was warped so bad that the axles didn’t fit properly and would have caused some premature wear issues. The center tubular crossmember was insufficiently installed and triangulated. It provided no resistance for vertical support of itself nor for twist or beam resistance. Not even the forethought to support the transmission, it just took up space and added weight. The decision was made to pretty much scrap the whole frame. We sent the frame over to our powdercoater to have them bake the coating off and sand blast back down to good metal. I don’t know if anyone has ever done it, but welding on anything with powdercoating is nasty stuff. What we got back shocked us even more, there were sections of boxing plate and front suspension crossmember that were not welded at all, others so poorly welded they were doomed to fail. No choice but to cut it apart. Right rail getting the treatment in the dirty room. There were a few areas like this with poor surface preparation, no weld penetration and no structural substance to hold the truck together. Once down to bare rails Dr Marvelus and I commenced building some fixturing to hold the rails in place. This is where we spent far too much time on this build but we have some solid frame building gear to build the next one of these frames that come through the door. This also helped us get the frame rails straight and true, I believe the Dr spend nearly a week stripping and straightening to get to this point. This was a 1Ton frame, so the shape is slightly different and the arch over the rear axle was much lower and didn’t allow for sufficient axle travel at the ride height we wanted. After a mockup of the body, bed, fenders and running boards we determined how much more arch over the axle we could use. We documented the important stuff and I drew up some new frame parts, cut and the good Dr MIG stitched them together and finished them to a stamped clean finish before grafting the new arches into the frame. Meanwhile I went about the front end, the stock front horns of the frame rails were absolute trash. Bent, welded and twisted out of working condition I decided to build new rails, but make them parallel from the firewall forward. I did similar on other trucks like the one we did for the Dynacorn Corporation, it gives you quite a bit more room for engine mounts and accessories as well as steering and so on. I’m trying something a bit different with my boxing plates these days. Instead of the traditional plate or stepped-in boxing plates, these are C-shaped and thicken the frame rails to 3″ wide. The thicker frame rail will be much stronger and because of the lap joint, bowing after welding should be kept to a minimum, stronger weld and almost no finish grinding is necessary. Next up was getting the front suspension in place and the center tubular crossmember. The front end is late C4 Corvette, fully polished and has Global West Del-A-lum bushings installed otherwise stock. The rack is FOX platform stuff and I had to render everything in my software to determine the geometry. The goal wasn’t ultimate handling but a good compromise between good handling and ride comfort. I think I found a good mix that keeps the roll center near ground level, has reasonable camber change and of course near zero bumpsteer. 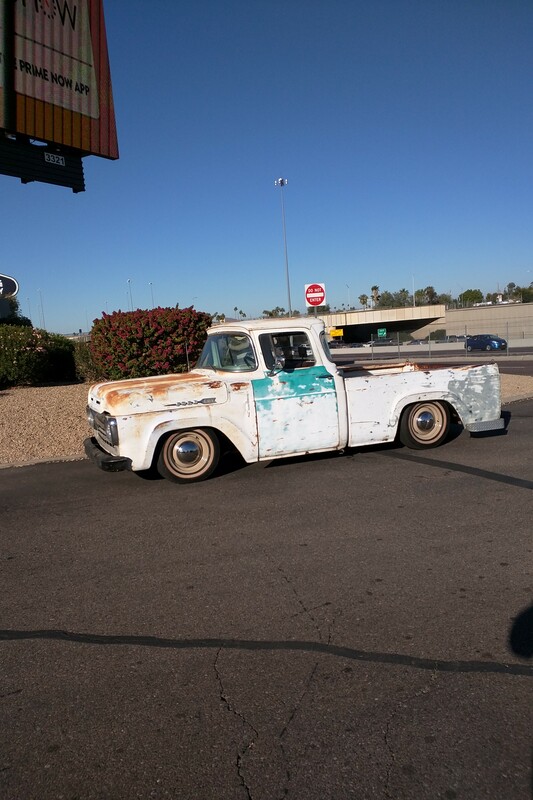 I could not dial it all out because of the FOX tie rod ends. Then I could go about designing the crossmember to hold it all in place. The tube center X-member and integrated transmission mount got bent up, coped and TIG welded together. Note the lower two tubes of the X-member are parallel. This makes transmission swaps possible without having to fabricate new mounts. The trans mount itself has an offset to it so that a slight tap and twist counter clockwise lets it drop right out of the structure. If it didn’t, it would be very difficult to remove it. The rear is a triangulated four link, designed to be close to the 100% anti squat and adjustable somewhat for pinion angle and centering. Nothing too special, just repurposed TCI parallel four links in stainless. We used the lower bars as is but shortened the upper bars to 17″. I fabricated a new crossmember to transition the frame rails at the front attachment point of the four bars. additional crossmembering for the four link to attach and to stiffen the frame rails. The old narrowed housing was out of alignment and was in sad condition that we were asked to retube it. The rear axle housing was completely TIG welded and I made custom brackets to hold the lower bars and coil overs. Dr Marvelus made the upper bar tabs. The last bits were fabricating motor mounts, upper control arm mounts and coil over mounts then we went in in a flurry of activity. Then two intense days of TIG welding to finalize everything as it came out of the frame fixutring and became a roller. The rolling chassis complete, we are moving forward with the build. Right now we are adding exhaust, fuel tank and fitting the cab to the frame. Stay tuned for more updates!